Are the Democrats cooked for 2010? Will the GOP continue it's rightward drift? 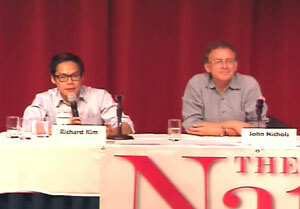 Richard Kim and John Nichols explain, aboard the 2010 Nation Cruise. During this year's Nation Cruise, senior editor Richard Kim and Washington correspondent John Nichols explained how the Tea Party's influence and the Democrats' dreaded enthusiasm gap will play out in this election. For the last twelve years, the annual Nation Cruise has facilitated numerous opportunities for fruitful dialogue among America’s leading progressives and The Nation’s readership. During this year’s cruise, senior editor Richard Kim and Washington correspondent John Nichols explained how the Tea Party’s influence and the Democrats’ dreaded enthusiasm gap will play out in this election.